Forty five percent of American adults are smartphone owners. My guess is that a good portion of those must be business owners. Smartphones supercharge your productivity. But they also supercharge your cell phone bill. If you have been searching for options, this review is for you. StraightTalk, a provider of prepaid wireless service, provided a short term loaner iPhone 5 for this review. My purpose in this review is not to extol the virtues of the iPhone 5 — the awesomeness of Apple’s latest phone is not to be under-rated, though. It is a sweet and powerful device and you don’t need my recommendation if you are already an Apple fan. However, if you are not, StraightTalk has a variety of phones on their prepaid plans. The purpose of this review is to highlight that there are other options to have an affordable cell phone plan without a long-term contract and the subsidized phone you usually get along with a long-term contract. 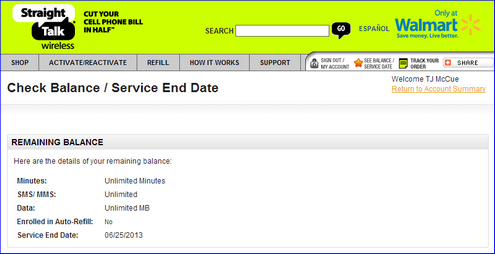 Here’s a quick look below at my “cell phone minutes” dashboard. If I had the $30 plan, I’m sure it would show more detail. You can also top up your prepaid balance here, of course. No long term contracts. You go month-to-month. You can buy an unlocked phone and move from one provider to another. It does take some patience and tech chops, however. For example, the elegant Nexus 4 phone from Google is reportedly possible to put on the StraightTalk service. I’ve read mixed results, though. Smaller carriers score better in the customer satisfaction arena, as reported by the American Customer Satisfaction Index that rates the wireless phone industry (among others). You can walk into a Walmart and many other retailers, and buy a phone and a plan. You have to buy a phone at full price. There is no major carrier subsidizing your phone for you with free or low prices to entice you. The loaner iPhone 5 retails for about $650. However, to be fair, if you crunch out major carrier plans that are usually more per month, you will likely find that you are paying more over that two-year contract. Month-to-month prepaid plans can be a bit confusing. Your minutes run out in 30 days usually. In this case, there was no report on calls made or received. I would like to see a way to pull that kind of report. It would help with some tax requirements, I’m sure. The “ALL YOU NEED” plan for $30 a month to receive 1000 minutes, 1000 text or multimedia messages, 30 MB of data transfer for data phones and 411 calls at no additional charge. $30 per month. The unlimited plan for $45 a month to receive unlimited talk, text and data nationwide anytime with calls to 411 at no additional charge. There is an international version of this for $60/month. Overall, I find the no-contract, prepaid type phone carriers to be one of the best ways to save money in my small business. Although StraightTalk provided a loaner phone, I did not receive any special customer treatment. I found the signup process to be painless and had good customer support throughout my review period. 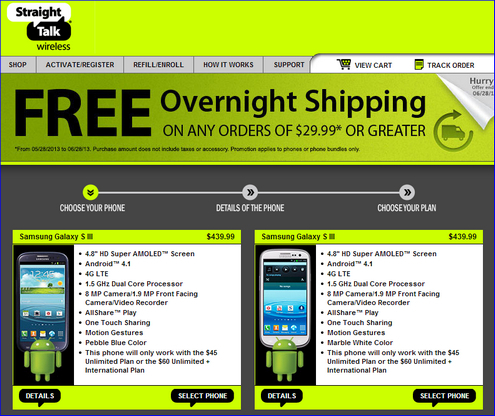 StraightTalk offers a range of smartphones (and not so smart ones, too — feature phones) starting from free. There were a few nice LG Optimus phones for $149, a Blackberry Curve for $129, and a Samsung Galaxy Precedent for $79. And for those of you that fall into the category of describing your cell phone as something you “can’t imagine living without” as I’d mentioned previously, here are 4 ways to tell if you are addicted to your iPhone 5. Just in case you’ve been sleeping with your phone and are beginning to wonder if that is a problem….